If you’re like most households you probably have more than one bottle of hydrogen peroxide in your kitchen cabinet or under your bathroom sink. Hydrogen peroxide has been around for about 200 years. It uses has seemed to expand with more people finding that hydrogen peroxide does some pretty amazing things. We believe that anyone who is thinking of going off the grid or living in a similar “do it yourself” scenario should have access to this awesome and cheap product. A 32oz. bottle of 3% hydrogen peroxide will run you about $2.00 – $3.00, while a larger 1-gallon bottle will usually run about $6.00 – $7.00 (prices vary slightly from WalMart versus a grocery store). If you are planning on stocking up on a must-have item, hydrogen peroxide should be on that list. Here are 12 handy uses for the H2O2 that will help you live a sufficient and healthy lifestyle wherever you might be. You can use hydrogen peroxide to remove dirt or other contaminants from freshly picked fruit and vegetables. Do this by spraying them with 3% hydrogen peroxide. 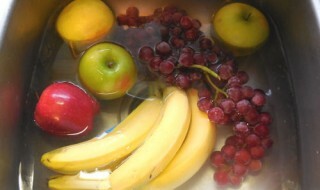 After spraying the fruits or vegetables, let them soak for several minutes before rinsing them in cool water. Raw meat such as fish, beef, chicken and other foods are often cut on cutting boards, countertops, or other designated areas. This can quickly lead to many germs and really nasty bacteria if left untreated. Soaps sometimes do not do the job. After each time of cutting meats on these surfaces, you should regularly clean them. Simply use a 3% hydrogen peroxide spray bottle to thoroughly cleanse these areas. It’s known that some fungal spores can often impede (slow or even halt) seed germination. Almost any type of spores can be removed from the seeds and germination greatly improved by simply soaking your seeds in a normal mixture of hydrogen peroxide. If you live off the grid you may have one, two, or more dogs or cats that are outdoor animals. Give it enough time and one of your dogs or cats will get ill by eating something that makes them very ill. This could be decaying carcass, poisonous plants, or some other bacteria that will make them lethargic and sometimes immobile. In such cases, you can give your dog or cat a dose of hydrogen peroxide. This will induce vomiting from your the pet and can help to purge the dangerous substance(s) they have eaten. To ensure you have the best oral hygiene possible, it’s important that your oral products, i.e. toothbrushes, dentures, or other oral care products are regularly disinfected. One of the easiest ways to do this is by soaking them in hydrogen peroxide. Germs and bacteria are killed in this process and are cleaned in no time. If you live off the grid or are planning to, you or someone you might know may at some point get a foot fungus. Apply hydrogen peroxide around and on the area that’s affected by the toe or foot fungus. This will help remove bacteria and the fungus after several treatments. I remember growing up and getting swimmer’s ear or an ear infection from earwax. My mother would put 6 to 8 drops of hydrogen peroxide in my ear using a small dropper. Immediately after this is done it’ll sound like popcorn is being popped in your ear. But this is the hydrogen peroxide at work dissolving and eating up the ear wax. You may need to do this several times. But it will quickly ease your ear ache and help to clear up the infection. Living away from a dentist can be a challenging thing. But off the grid, you might want to consider taking advantage of hydrogen peroxide for teeth whitening and also for an antiseptic mouth wash. A once every day or two hydrogen peroxide rinse will kill germs in the mouth and remove bacteria that can cause tooth decay. For many decades people have used hydrogen peroxide for disinfecting small wounds and to help avoid infection. Hydrogen peroxide is a natural anti-skeptic. But please be careful, as using hydrogen peroxide on your skin or any wound will cause more harm than good. Only dab a little on a few times and do not soak any wounds with hydrogen peroxide, as it’s thought that too much could hinder healing. Just like above, if you or a family member is suffering from a toothache, you can ease the pain by rinsing or gargling with a mixture of coconut oil and hydrogen peroxide. If you have infected sinuses it can be very painful and hinder breathing. One way to help clear your sinuses and provide some much-needed relief from the pain is to use hydrogen peroxide as a nasal spray. You can gauge the amount of hydrogen peroxide that’s needed depending on the severity of the sinus infection. For most cases though a 3% hydrogen peroxide mixture in a cup of non-chlorinated water should work well for the infection. To use hydrogen peroxide, mix four parts filtered water with one part 3% hydrogen peroxide. Irrigate the nose using a spray bottle or neti pot. Did you know that hydrogen peroxide can be used for marinating fish, poultry, or other meats? Don’t feel bad. most people do not know this either. 🙂 To easily marinade your fresh fish, meat or poultry, simply place the meat a casserole dish and cover it with equal parts of hydrogen peroxide and water. Set the casserole dish in the refrigerator for about 30 minutes, then rinse before cooking. If you’re interested in the usefulness of hydrogen peroxide, here are some products that you may like. This is a 27-page book written by Rebecca Wilson. It is a reference book that will teach you many things about hydrogen peroxide and its different uses. It contains eight chapters that will tell you how and why you should use hydrogen peroxide for beauty, in the bathroom, in the kitchen, for your health, for fabrics, for pets, and for your garden. It includes very useful household tips as well. If you’re a prepper who’s preparing for an apocalypse or even just someone venturing out on your next camping trip, you will find this book by Ryan Brenner very useful. This guide discusses 15 great uses of hydrogen peroxide and how it can be used effectively for prepping or any trip that will take you outdoors for an extended period of time. Once you finish this guide, you will never look at hydrogen peroxide the same way again. This is a great book that can turn the tables for your prepping sessions. This 16-ounce bottle contains a 3% solution of hydrogen peroxide which can help prevent infection in minor cuts, scrapes, and abrasions. It has a tamper-evident seal that ensures sterility of the solution. It is a perfect first aid refill or a standalone supply that you can also use in your household. This is a 4 oz. bottle of Hydrogen Peroxide spray. It has an active ingredient 3% hydrogen peroxide that can help cleanse and prevent infection in minor wounds, skin abrasions, and cuts. Aside from that, you can also use it as a standalone supply for other household uses. The application of hydrogen peroxide is easy because it is placed in a pump spray bottle. This hydrogen peroxide spray has an active ingredient Hydrogen Peroxide Topical Solution USP 3%. It is a first aid antiseptic treatment for minor cuts and scrapes. Aside from that, it can also be used for other household uses and for survival as well. 6. Hydrogen Peroxide Topical Solution 32 oz. If you want to stock hydrogen peroxide at home, then getting this 2 pack of 32 oz. bottle will be great for you. It contains 3% hydrogen peroxide as an active ingredient. It is able to sanitize surfaces without using toxins from bleach and other cleaners. It can also come in handy for other household uses. Hydrogen Peroxide certainly has a lot of uses. It’s surprising to know that aside from helping us clean our wounds, they can also be used in many other ways like in cleaning vegetables, using as a mouth rinse, and even for marinating foods. Therefore, Hydrogen Peroxide should really be in our list of must-have items to stock-up at home.